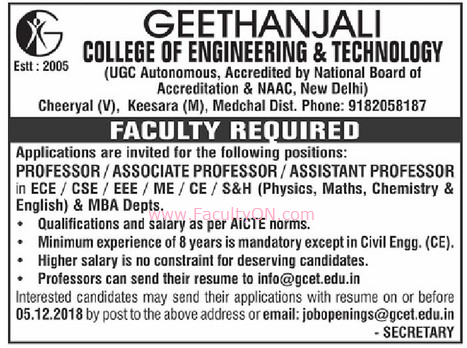 Geethanjali College of Engineering and Technology, Medchal has advertised for recruitment of Non-Teaching Faculty- Professor / Associate Professor / Assistant Professor jobs vacancies. Interested and eligible job aspirants are requested to apply on or before 05th December 2018. Check out further more details below. About College: Geethanjali College of Engineering and Technology is emphasizing technology as a key competency for the generation next and thereby accelerates their though process of research and technology development at the cutting edge. with proficient faculty, sizeable space, state-of-the-art facilities it imparts quality education to the aspiring engineers finishing them into competent.